This year-long supervised research course provides students with first-hand experience working as part of a research team and develops a working knowledge of the theory and applications of transdisciplinary research. Students are provided with an overview of research program issues; develop oral and written communication skills, data management skills, team building skills, critical thinking skills, and professional work environment skills; trained in mixed methods relevant to factors that contribute to child and family health; identify opportunities and barriers in transdisciplinary team work; and prepare a scientific presentation that reflects the knowledge of transdisciplinary science gained through working on actual research projects. Applications are now being accepted for the 2019-2020 school year. Deadline for applications is Thursday, April 25, 2019. "Working on STRONG Kids helped me understand some of the material I had been studying in my health statistics class this semester." 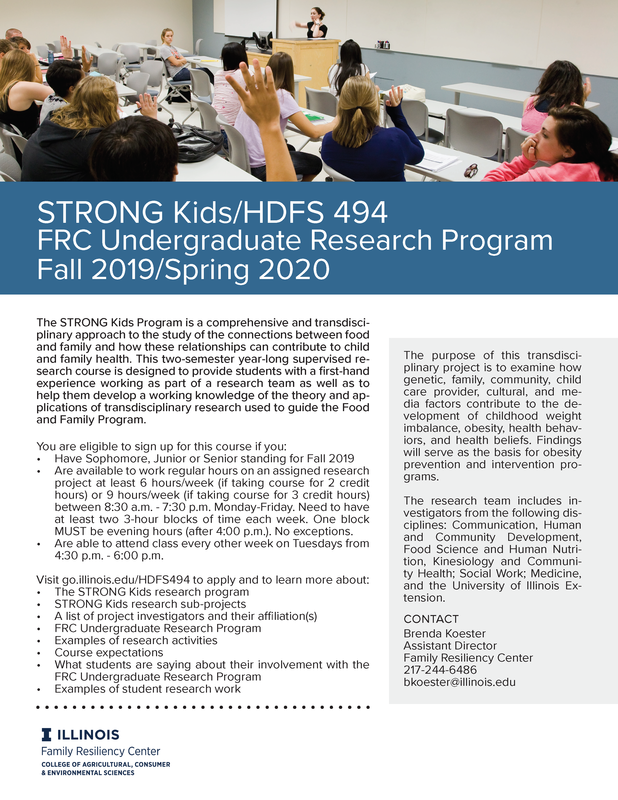 "STRONG Kids gave me the opportunity to build relationships with faculty and students from multiple disciplines and to be involved in vital comprehensive research." "I think that this is great research experience that helps you to develop many skills such as communication, team work, flexibility, patience, and critical thinking, among many others." "I think that anyone, especially if they're planning to go into health care or nutrition, would really gain useful experience, a grasp on medical problems, and realize first-hand how many factors can contribute to one issue, like obesity." Research week at Illinois brings students and faculty together to learn more about their research and its potential to change the world. Throughout the week, students showcase their projects at events across campus leading up to the Undergraduate Research Symposium. The symposium invites students from all academic disciplines to share their research through presentations, posters, and performances, and each year HDFS 494 students are able to present their research findings at the event. 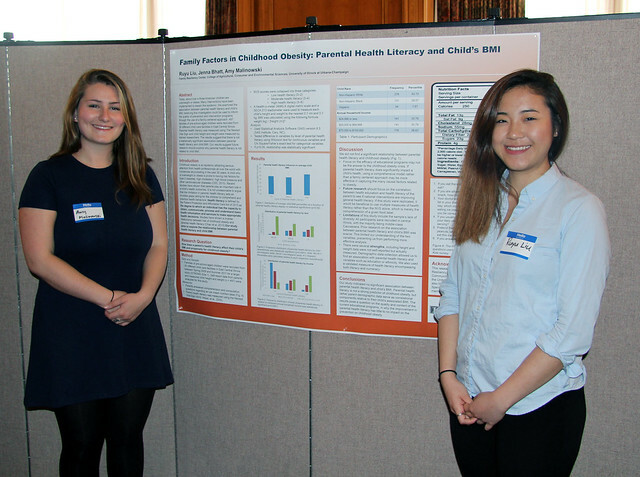 HDFS 494 students participating in the April 2016 Undergraduate Research Symposium are in the album below.